Another popular small fruit for backyard gardens are raspberries. Red , black, purple, and yellow fruit types are available.Almost all raspberries bear fruit on 2-year-old canes, then the cane dies. This calls for ongoing pruning as a regular care practice when growing raspberries. Both summer bearing and everbearing (June, Fall) varieties are available - except in the case of black raspberries. 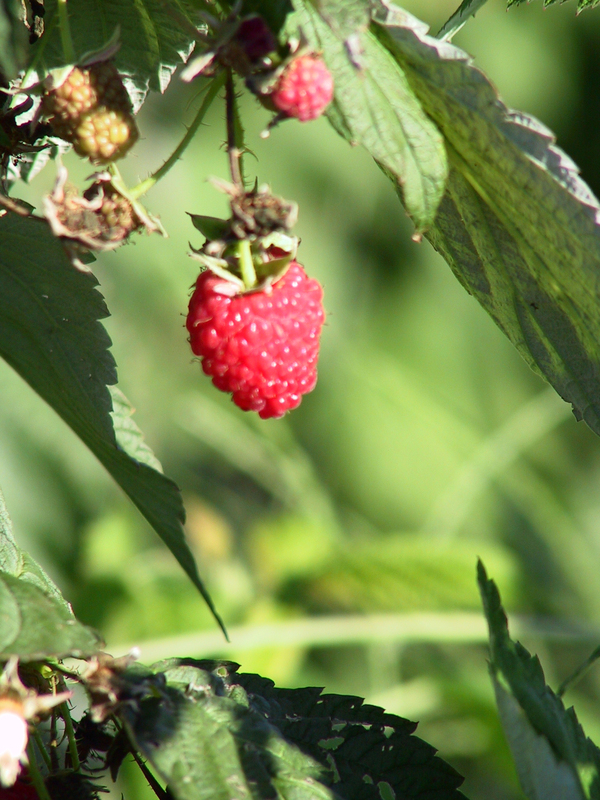 Red raspberries tend not to show virus symptoms if infected but aphids can still spread the virus to Black raspberries that tend to be very susceptible. Plant black raspberries away from red raspberries but if you have a limited space, always plant black raspberries upwind from the red raspberries so that aphids are not blown by wind from red to black raspberries. Suggested red raspberry cultivars for northern Illinois include 'Boyne,' 'Latham,' 'Heritage' (everbearing), 'Caroline' (everbearing), 'Autumn Bliss' (evebearing) and 'Ruby' (everbearing). For yellow raspberries, try the cultivar 'Goldie' and 'Kiwigold.' 'Brandywine' and 'Royalty' are suggested purple raspberry cultivars, and 'Jewel' is a suggested black raspberry cultivar. Plant raspberries in early spring. Red raspberries should be planted at the same depth as they grew in the nursery. Purple and black raspberries should be set about one inch deeper. Raspberries are usually sold as bare root stock, so inspect the root system, removing any broken or damaged roots. Spread the roots out when placing them into the planting hole. After planting, cut red raspberries down to about an 8 to 12 inch height. Purple and black raspberries should be cut to ground level and the material removed for disease control concerns. If the plants were produced by tissue culture, no pruning is needed after planting. Fertilize raspberry plantings about 10 to 14 days after planting. Apply about two ounces of a 5-10-5 fertilizer around each plant. Starting the second season and annually thereafter, fertilize raspberries in early spring before growth begins. Apply a balanced fertilizer, such as a 10-10-10, at a rate of 15 to 20 pounds of fertilizer per 1,000 square feet of planting. If using the hill system, apply about one-half cup per plant. Don't fertilize raspberries in late summer or early fall as it may force new growth that does not harden off properly for winter. Raspberries grow best when some type of support is provided for the canes. Plants may be planted in hills or hedgerows. Red raspberries will readily spread by root suckers while purple and black do not. If using the hill system, plants are grouped around a strong stake or pole, and then trained to grow on the support. Raspberries can also be grown on trellises in rows. One method is to run 2 wires about 18 inches apart horizontally between posts with cross bars. This set of wires should be about three feet off the ground. The raspberries then grow up between the wires and are supported. This creates a hedge of raspberries about 18 inches wide or so. This method is popular and does not require any tying of the canes to th e supports. Another option is to run two wires about two feet apart vertically between posts, and the raspberry canes are tied to the wire supports. The lower wire should be about three feet off the ground. Raspberries must be pruned on a regular basis to stay productive. The basic rule to remember in summer bearing raspberries is that fruit is produced on the cane in the second year of the cane's growth, then that cane dies and should be removed. Pruning needs vary with the type of raspberry being grown, however. Red and yellow raspberries should be pruned twice a year. Early spring pruning should remove weak canes and then a second pruning should be done right after harvest to remove canes that have fruited. Do not summer prune, or what's often called topping, red or yellow raspberries. Another option with everbearing cultivars, such as 'Heritage,' is to grow them for a fall crop only. These types will fruit the first fall of the canes' growth, then further down on the cane the following season. All canes can be removed in late fall so only the fall crop is used. Often yields and berry quality is superior when following this method for these types of raspberries. Purple and black raspberries require pruning three times a year. In addition to the spring and after harvest pruning mentioned above, they also require summer topping to encourage development of lateral shoots off the canes. All new shoots should be pinched back in summer 3 to 4 inches once they have reached desired height. Lateral branches then develop that will produce fruit. Regular pruning helps reduce cane blight and other disease concerns. Viruses are also a potential major disease problem. Plants infected with virus will appear stunted, dwarfed, and will be unproductive. 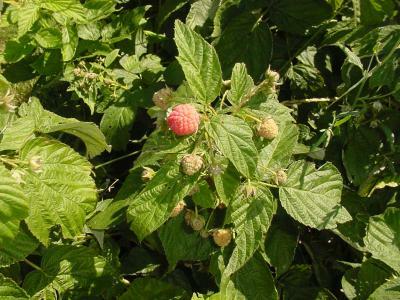 It is suggested that you go through the raspberry plantings at least twice a year to scout for virus infected plants. Remove and destroy these plants as soon as they are noticed. Always purchase certified nursery stock to help reduce potential virus problems. Do not share plants with other gardeners that have been dug out of gardens and keep wild brambles in the area under control. For more information, visit our Raspberries & More website.